What better way to experience Canada’s outdoors than trying your hand at clean, off-grid living? It’s an investment to convert to solar powering your RV. It’s also a time-consuming project if you choose to go the DIY route. However, when all’s said and done, it’s free energy in your pocket! For folks who like to camp in the backcountry, or just avid RVers looking for ways to minimize their energy consumption, the project is well worth the efforts. All you need is a little bit of sun and the open road. There are so many options when it comes to solar powering your RV. Where do you even begin? We have a few tips that might help you start your research. 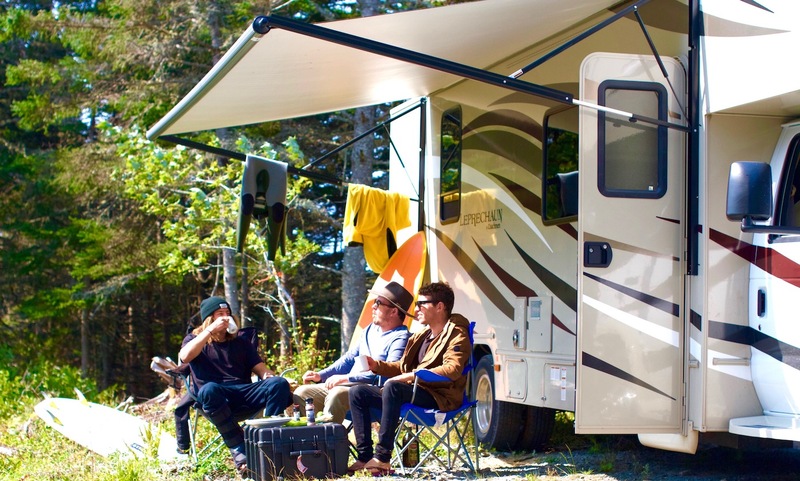 It’s easy to add solar panels to your RV, but it’s expensive if you buy too many to start. Consider your daily use: will you need to power electronics like laptops and televisions, or do you spend most of your time outside? Will you use shore power at all, or do you want to be entirely self-sufficient? Some dealerships can help you calculate exactly the power you need to meet your energy requirements. There are a few differences between flat and curved solar panels aside from their shape. Curved is more aerodynamic for the road, but they can’t be tilted to face the sunniest spots because they curve smoothly around your rig’s body. Curved panels are lighter, while flat panels are more durable. Essentially, though, it comes down to budget—curved panels are the more expensive option. No matter the size of your solar system, it will require a battery. The battery packs the real strength when collecting energy from the sun. Many suggest installing a battery large enough that you could survive for 3-4 days without having to recharge, just in case you hit a bad batch of days. Again, ask your dealership to direct you to the best option for your energy needs. Protect the system you’ve worked so hard to set up! A solar charge controller prevents you from overcharging your batteries because it controls the power moving from the panels themselves to your battery storage. This is one component that you don’t want to cheap out on. Actually—it’s best to search for quality for your entire solar power system! You have your solar panels and your batteries—how do you make your appliances run? Ensure that all systems are compatible. You may need to buy a power inverter to provide energy to your standard appliances depending on the difference in voltage between your batteries and electronics. The same way you want to check that your solar system is compatible with your appliances, also purchase an inverter that allows your battery to charge on shore power if needed. This is a good idea if you don’t plan on using it often! If your rig is equipped for shore power, you will always have a backup in case something goes wrong with your system. There are so many more factors to consider when converting your RV to clean energy, but it’s best to talk to an experienced retailer to get the details. For now, though, we hope this helps to get your project started! Have you installed a solar energy system on your own RV? We’d love to know if you have any tips. Let’s start a conversation! Join our community Facebook, Twitter, Instagram, and Pinterest.